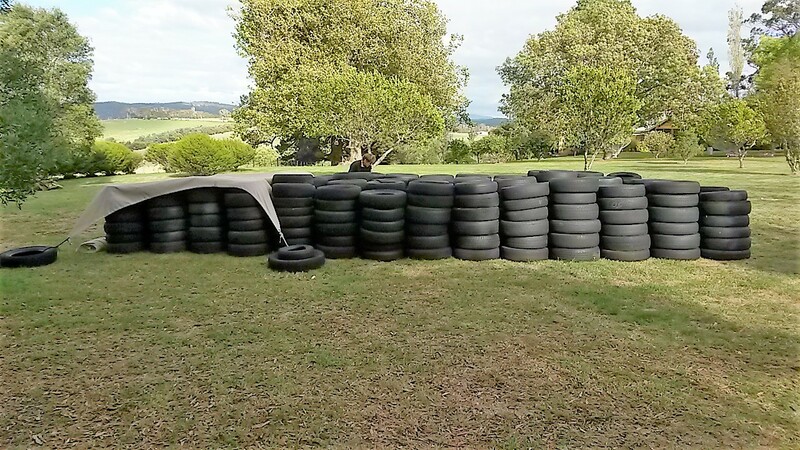 On 4 April 2018 the TCT’s campaign to cleanup used car tyres took another step forward with 420 tyres being collected from a property at Pipers River north-east of Launceston. This is our fourth successful tyre cleanup event and we have now collected, cleaned and sent for recycling a total of 2703 tyres that were inappropriately stored or illegally dumped. 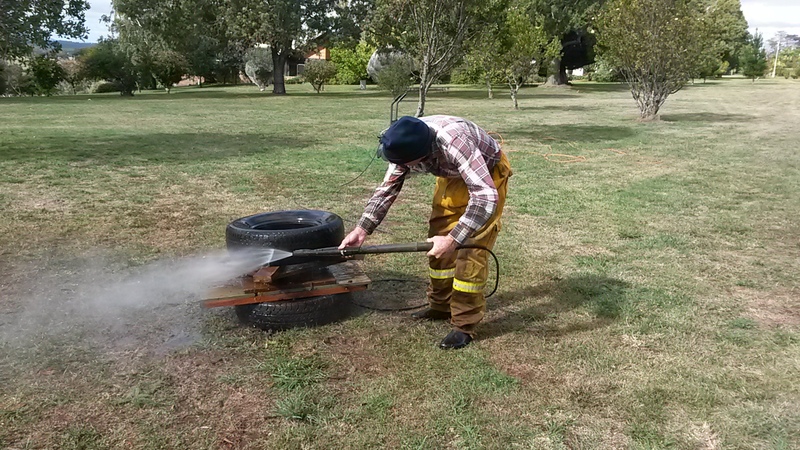 The owners of the Pipers River property, Pauline and Craig Smith, recently brought the property not realising there were hundreds of car tyres amongst several areas that had been left uncleared. The TCT thought Pauline and Craig were deserving of help, particularly as they were pensioners and offered to clean the tyres prior to collection. We offered to pay for the cost of collection. 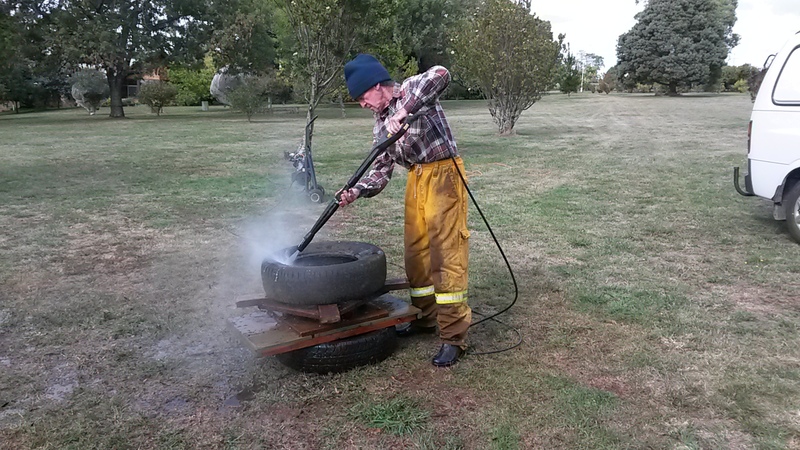 Finding it hard to find volunteers to help clean the tyres, the owners ingeniously developed a method of cleaning that proved effective and time efficient. 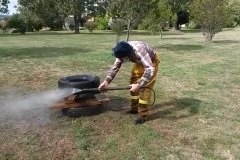 As can be seen from the photos, the tyre is held in a jig at a comfortable height off the ground and allowed to rotate as it is cleaned with a high pressure hose. We will investigate this system for use in other cleanup events. 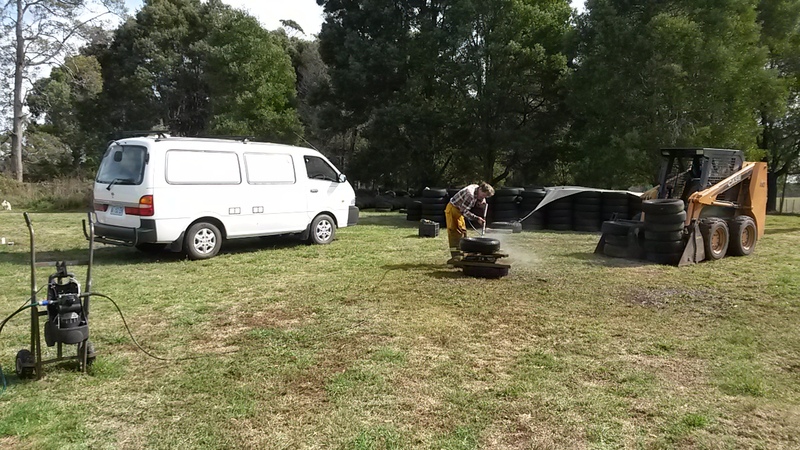 Cleaning tyres prior to transportation is essential (and now a legal requirement) to limit the risk of spreading soil and weed seeds and animals such as insects and spiders. Our congratulations to Craig and Pauline for their hard work and innovative thinking. 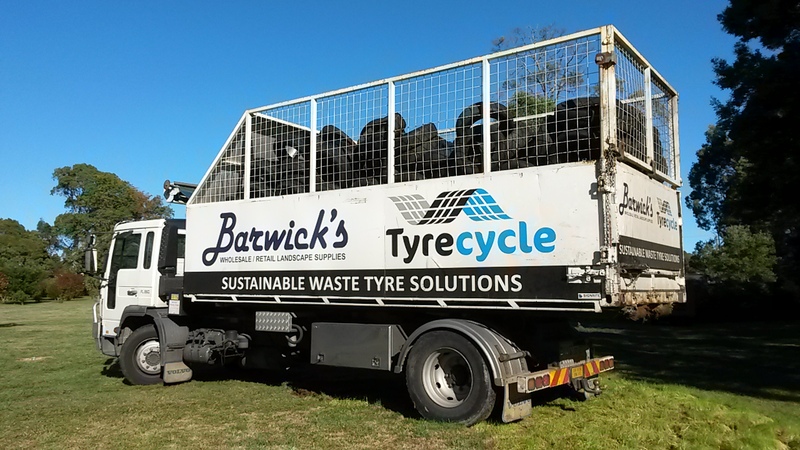 We also congratulate Tyrecycle and Barwicks for collecting the tyres so promptly and giving us a generous discount for collecting the tyres. 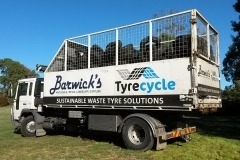 All tyres collected are taken to Brighton near Hobart where they are coarsely shredded by Barwicks and then shipped to Melbourne where Tyrecycle recycles the rubber and steel. 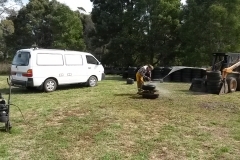 The cost of tyre collection was paid for out of a grant the TCT obtained from the Northern Tasmanian Waste Management Group, thank you also to NTWMG. Now we are looking for our next site to clean up. Do you know of a car tyre dump in the north-east of Tasmania? For the most deserving projects we will cover the total cost of having tyres collected and taken for recycling. 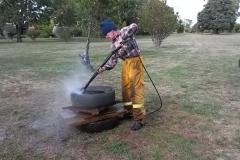 Assistance with gathering and cleaning tyres is essential. All tyres will be recycled. Clean-ups must have a community or environmental benefit. Tyres must be in the north-east (63 phone area). Limited funds: first in gets preference. Preferred project sites are: reserves; council parks and coastal areas; private bushland/creeks; school yards and equestrian and other sporting centres. 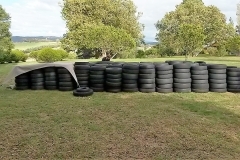 Found tyres dumped in Tasmania? Please go to our donations page.